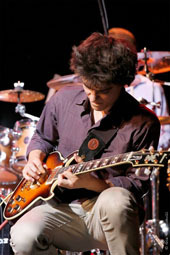 The French jazz guitar prodigy - Tom Ibarra opened Tbilisi Rhythm Festival on June 12. The concert took place at Rustaveli Theatre. Tom Ibarra Group created a charming environment full of diverse harmonies, melodies and solos by his amazing musicians. Compositions by Ibarra was performed at the concert. The concert was followed by Jam Session on the next day at Melograno, featuring Tom Ibarra and Sparkling, as well as famous Georgian musicians Beka Gochiashvili and Papuna Sharikadze. Born in October 1999, Tom Ibarra began playing guitar at the age of 6 and was influenced by artists including Miles Davis, Pat Metheny, Weather Report and Wes Montgomery. He released his debut album ‘15’ in 2015. He is s playing the Ibanez guitar with DV Mark amp. Along with numerous awards, Tom is the winner of this year’s “LetterOne ‘RISING STARS’ Jazz Award”. The "LetterOne RISING STARS Jazz Award" is a yearly, submission based award that is given by a jury. The winning musician will be taken on the “Rising Stars Jazz Award” tour and given the opportunity to perform concerts at some of Europe's most prestigious Jazz festivals, playing before thousands of Jazz fans, Tom Ibarra thanked the festival organizers. “I am proud of the interest Georgians have for my music! Thank you, Ani Lagidze for inviting my group to the Tbilisi Rhythm Festival,” reads Ibarra’s status on Facebook. Tom Ibarra is currently on tour with his upcoming concerts in Ukraine (June 30), Norway (July 4), Germany, Spain, Italy, etc. Tbilisi Rhythm, a brand new International Arts Festival founded by Tagis Art, is holding two concerts this year: Tom Ibarra and 33a. On June 23, Niaz Diasamidze -33a will perform at Tbilisi Concert Hall. The concert is held within the frames of Check in Georgia. 33a is a Georgian folk-rock band founded in Tbilisi in 1994. The band combines Georgian and French folk influences with pop and reggae elements.